Oxford University Brass Band is the only non-auditioning OUMS instrumental ensemble, aiming to provide brass players in Oxford with the more traditional Brass Band style of playing. They have termly concerts at a variety of venues throughout Oxford, with programmes ranging from Brass Band competition pieces, film music, marches and many others. On top of these termly concerts they also perform at various events around Oxford such the full band playing at the Encaenia Garden Party and marching though the City, leading the Christmas Light Parade. 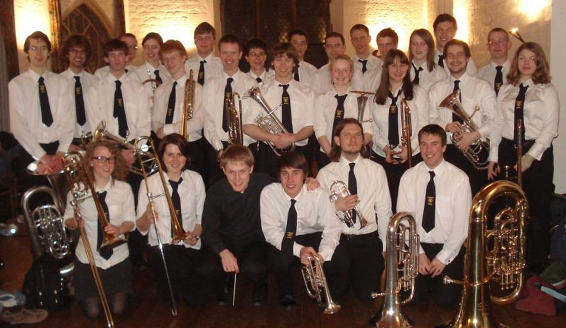 There are smaller groups within the Brass Band who provide music at functions events such as the Varsity Rugby Match and various college balls. On top of all these events the band annual competes against a dozen other University Brass Bands in the UniBrass competition, giving an insight to its players into the world of competitive brass bands. Rehearsals are held on Sunday evenings at the music faculty and for more information please contact the President.